Printing pharmaceutical cartons digitally eliminates plates and reduces make-ready, streamlining the entire process by reducing 13-plus steps to three. This simplified process means fewer opportunities for error, defects and waste. Since 2005, we have produced more than 10,000 SKUs… and counting! The elimination of printing plates, reduced make-ready, and lower die charges enable lower costs and significantly reduced lead times. You can now receive labels and folding cartons with digital printing technology. Nosco's HP Indigo 30000 Digital Carton Press provides short- to medium-run cartons faster and at a more affordable cost. Thanks to our advanced capabilities, Nosco is able to offer cost-effective services. This includes the ability to supply carton sheet sizes of 21 inches by 29 inches, in quantities of up to 50,000 units per commodity. Each order totals 5,000 sheets. We have the capabilities to help you transform your pharmaceutical carton designs into reality. Our extensive finishing options include various methods for enhancing the security of your packaging, helping it stand out on store shelves, while keeping you in compliance with regulations. 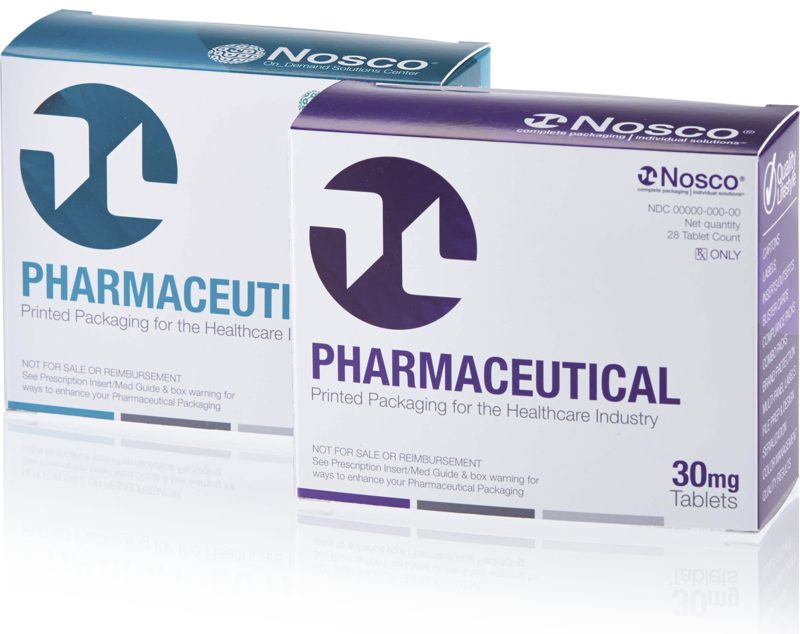 With more than 110 years of experience serving the healthcare industry, no one knows more about pharma carton box design and manufacturing than Nosco. We pride ourselves on delivering customized solutions that improve efficiencies for our customers. Our services help by enhancing supply chains, cycle times, lean initiatives, and product launches. In everything we do, we demonstrate a true and lasting commitment to process excellence and quality. When you’re ready to experience the Nosco difference for yourself and your organization, get in touch with us to learn more. Our experienced teams are looking forward to serving you. Interested in HP Indigo’s digital features? Click here.